The following is an article that I wrote in the first issue of The Siren on the above exhibition, which was held at the Royal Cornwall Museum, Truro for a whole year from November 2012 to November 2013. "This year has seen unprecedented exposure for Cornish art in the national press, due to the success of the exhibition Amongst Heroes - the artist in working Cornwall at Two Temple Place, London and the interest generated in the Lamorna colony by the exhibition and film, Summer in February. Sadly, this has not extended to the exhibition that I have curated for the Royal Cornwall Museum, Truro, entitled A Century of St Ives Art 1840-1940. Confronted with the customary array of obstacles in getting early St Ives art publicized, I hope that you do not mind me giving my own show a little plug in the hope that, if you or your friends are in Cornwall this year, you will be able to squeeze in a visit. The exhibition combines selections from the Museum’s own collection of St Ives art, including a series of very early watercolours of the town that have rarely, if ever, been exhibited before, with work from my own extensive collection. Whilst it is impossible to do justice in a single show to the myriad of artists who derived inspiration from St Ives during this period, the exhibition contains works by such leading artists as Edward William Cooke, James Clarke Hook, Adrian Stokes, Julius Olsson, William Titcomb, Arthur Meade, Sydney Lee, Terrick Williams, Charles Simpson, John Park, Borlase Smart, Arthur Hayward, Dorothea Sharp, Leonard Richmond, Bernard Ninnes and William Lee-Hankey. A special feature of the exhibition is the group of pre-colony paintings (i.e. pre-1885), which combine Truro’s unique collection with a range of work by other early artist explorers. Whilst finalizing the selection, I casually asked the Museum staff if they had checked whether they had any watercolours of St Ives, as these would not have been listed in the Public Catalogue Foundation publications. When they did so, they discovered, to their surprise, a group of fascinating early nineteenth century images of the town by one or more anonymous hands. One of these had been used by Cyril Noall in one of his books, but otherwise they were unknown. As there is no sign of the wooden pier in any of them, they clearly date from before 1864, but might well be much earlier. As one shows some of the villas on The Terrace built by Sir Christopher Somerton in the 1820s, they probably post-date this decade. They all depict the harbour full of sailing ships, capturing the era when fleets of sailing ships operated from St Ives, with the consequent need for shipbuilders, sailmakers, ropemakers etc. Another shows the view over the harbour from one of the Providence mines on the hills behind the town. A naive monochrome work, most likely by a different hand, captures the extraordinary spectacle of the harbour beach packed full of men and women carrying pilchards from seine boats. One feels that the whole town is involved, as a large catch is unloaded. The group of works, therefore, showcase the industries that made St Ives prosperous for much of the nineteenth century, albeit all collapsed together in the 1870s. Furthermore, the importance of the sea, not only for trade, but also for travel, can be seen from the depiction of what would appear to be the main road into the town - a rough, narrow, steep track bounded by stone walls. 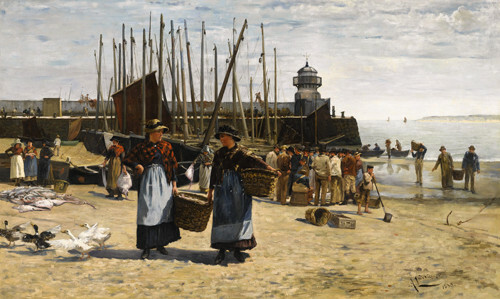 John Mogford and Thomas Hume, who married a Truro artist, Edith Dunn, are some of the other pre-colony pioneers featured, but the stand-out painting is Alberto Ludovici Jnr’s Fish Sale, St Ives of 1883. As his name suggests, Ludovici was of foreign origin; whilst his family could boast of both Bolognese and Venetian noble ancestry, he had been born in Prague and had trained in Paris - a fellow pupil being Jules Bastien-Lepage, who was to become a cult figure for so many of the early Cornish colonists. However, his father, Alberto Ludovici Snr, a decorative painter, after fleeing Paris at the time of the Prussian invasion in 1870, had become a pillar of the English art world, being Treasurer of the Society of British Artists (SBA). His son also settled in London, after his marriage in 1875, and had himself become a member of SBA in 1881. 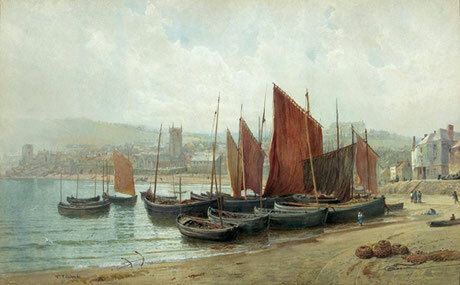 Ludovici’s visit to St Ives in the summer of 1883 was clearly inspired by a group of paintings of St Ives, by Edwin Ellis, shown at the Winter Exhibition of SBA in 1882. As an advertisement for the attractions of St Ives as a centre for both figure painters and marine artists, Ludovici’s work can hardly be bettered. What is more, the painting, albeit receiving no publicity in the past, pre-dates by a year not only Stanhope Forbes’ famous depiction of a fish sale at Newlyn, but also the well-known visit to St Ives of James Whistler (with his pupils, Mortimer Menpes and Walter Sickert), which, as this painting demonstrates, has, in the past, incorrectly been given too much significance. As Ludovici tended, later in his career, to paint rather typical Victorian genre scenes, involving ‘Society’ subjects, his Fish Sale, St Ives is very different and must rank as not only one of his finest works but also one of the most interesting and important pre-colony paintings of St Ives. The exhibition also highlights the international influence of the colony, a theme that I am always keen to emphasize, as it has been completely overlooked in the past. American artists featured include Edward Simmons, the key figure in the early years of the colony, and both Frederick Waugh, who worked in the colony in 1895-6 and 1906-7, and Paul Dougherty, who visited each summer from 1908-1914, and who both made their names in America with their Cornish marine paintings. Waugh is represented by a depiction of Lamorna, and Dougherty by Summer’s Day, Coast of Cornwall, a work only recently added to the show. The leading American Impressionist painter, Elmer Schofield, who did so much to publicize St Ives in America, and Guy Carleton Wiggins, who met his wife in the colony in 1914, having lived in the town with his famous father, John Carleton Wiggins between 1895-7, are also represented, as is Henry Bayley Snell, who bought a party of twenty of his female students to the town in the summer of 1914. A newly hung exhibit is a watercolour, Unloading the Catch, St Ives, by John Ward Lockwood, later associated with the colony at Taos in New Mexico, who visited St Ives in the 1920s. Other foreign artists, who came to study marine painting in the colony, such as the Canadian, Harry Britton, and the Australians, Sir William Ashton, Richard Hayley Lever and Charles Bryant are also featured. Finally, on the international front, there is a most unusual early work by the avant-garde French artist, Henri Valensi, who visited the colony in 1911. This was hung not only at the Paris Salon, but also in the famous Salon de Section D’Or exhibition of 1912 - the first Cubist show. Display cases feature fascinating archival material that I have collected, such as a Humphry Repton sketch of St Ives from 1791, whilst the Museum’s collection of pottery by Leach, Hamada, Cardew and Morton Nance will be just outside the Gallery. Please spread the word. St Ives representational art gets so little exposure and, accordingly, this is a not-to-be-missed opportunity."